Hillary Clinton’s role in Commercegate and Chinagate was revealed by Judicial Watch and included in the House Judiciary Committee Evidentiary Record December 1998. Lowell, and debate on H. Res. 581, beginning an impeachment inquiry. contributions. Bribery is specifically highlighted in the U.S.
Constitution as an offense warranting impeachment. President and members of his Administration. consulted with President Clinton in furtherance of this cover-up. Crimes and Other Offenses Relating to the Illegal Sale of U.S.
implicated the President’s top staff members in obstruction of justice. President Clinton. In both a sworn affidavit and Court testimony, Ms.
politics is driven by money; correct? A: He did say those–close to those words, as I recall. . . .
to use the trade missions to raise money; correct? States was, at least tangentially. A: Yes sir. It was his re-election that was at stake. Ms. Hill also testified that, in addition to the President and Mrs.
ropes,” Kearney wrote Trie after the trip. U.S. Embassy in Beijing to invite Trie to events with Mrs.
the late Commerce Secretary Ron Brown to cover-up these crimes. level best to accomplish this. gotten away with this criminal enterprise. Before I continue reporting on the Obama Rezko lot purchase in June 2005, the new book “Rezko for Radicals” by Mutual Bank of Harvey whistle blower Kenneth J. Conner and Conner’s Qui Tam lawsuit, I present the following article from 2008. From PJ Media June 18, 2008. “Barack Obama’s position on Iraq has shifted significantly over the last six years. What is interesting is how his position on Iraq matches up with developments in Chicago. Specifically, there appears to be a direct correlation between the rising and falling prospects of his longtime friend and fundraiser Tony Rezko’s attempts to secure multi-million-dollar contracts to build and operate a power plant in Kurdish Iraq and the senator’s Iraq flip-flops. I know that even a successful war against Iraq will require a U.S. occupation of undetermined length, at undetermined cost, with undetermined consequences. I know that an invasion of Iraq without a clear rationale and without strong international support will only fan the flames of the Middle East, and encourage the worst, rather than best, impulses of the Arab world, and strengthen the recruitment arm of al-Qaeda. So for those of us who seek a more just and secure world for our children, let us send a clear message to the president today. You want a fight, President Bush? Let’s finish the fight with bin Laden and al-Qaeda, through effective, coordinated intelligence, and a shutting down of the financial networks that support terrorism, and a homeland security program that involves more than color-coded warnings. But on April 5, 2004, Barack Obama appeared to significantly alter his position on Iraq. A YouTube video of Obama shows the incredulity on the interviewer’s face as Obama unexpectedly sounded almost like President Bush on the subject of retaining troops in Iraq. Interviewer: But you said that troops should be withdrawn. Obama: No, no. I’ve never said that troops should be withdrawn. What I’ve said is that we’ve got to make sure that we secure and execute the rebuilding and reconstruction process effectively and properly and I don’t think we should have an artificial deadline when to do that. What’s important is that we have a long-term plan in process and short-term security strategy. On April 3, the 1st Marine Expeditionary Force received a written command from the Joint Task Force, ordering offensive operations against Fallujah. This order went against the wishes of the Marine commanders on the ground who wanted to conduct surgical strikes and raids against those suspected of involvement in the Blackwater deaths. On the night of April 4, the U.S. forces launched a major assault in an attempt to “re-establish security in Fallujah” by encircling it with around 2,000 troops. At least four homes were hit in aerial strikes, and there was sporadic gunfire throughout the night. By the morning of April 5, headed by the 1st Marine Expeditionary Force, American units had surrounded the city with an aim towards retaking it. American troops blockaded roads leading into the city, with Humvees and concertina wire, and took over a local radio station, and handed out leaflets urging residents to remain inside their homes, and help American forces identify insurgents and any Fallujans who were involved in the Blackwater deaths. There’s not that much difference between my position and George Bush’s position at this stage. The difference, in my mind, is who’s in a position to execute. But Rezko Watch, a blog following the trial of the Chicago political operative and Obama’s close friend and contributor Tony Rezko, remembered that something else took place in April 2004. Obama was at a party on April 3 — two days before the video– with Nadhmi Auchi, a London-based Iraqi billionaire who attended a Tony Rezko party in Chicago. The Chicago Tribune blog covered Obama’s recollection of the party in depth. Late last week, Sen. Barack Obama said he didn’t recall meeting a controversial Iraqi-born billionaire at a party held at the home of his former friend and fundraiser, Antoin “Tony” Rezko, on April 3, 2004, because it was in the midst of his campaign for the U.S. Senate seat from Illinois. But a check on the senator’s calendar showed he had no campaign activities on the day of the Auchi party. TheChicago Sun-Times reported that despite Obama’s inability to recall meeting Mr. Auchi, two sources said the senator was present. According to two sources familiar with the gathering, the Obamas attended the Wilmette reception, which came less than a month after Obama’s Democratic primary win for his U.S. Senate seat. [In] January 16, 2007, ex parte proceedings before Federal District Judge Amy J. St. Eve, in the case of the United States v. Antoin Rezko, in the discovery of Mr. Rezko’s resources in order to set his bail awaiting trial. … The judge asked about Mr. Rezko’s creation, Rezmar International LLC. Mr. Rezko answered, “Rezmar International entered into contract with the Ministry of Electricity in — of — Iraq, to build a power plant and sell power to the government. And we were negotiating for over, now, I guess, two years.” Mr. Rezko added that the deal, for the never-built, $150 million Chamchamal power plant in Kurdistan Region, Iraq, was finally canceled November 6 or 7, 2006. But if Rezko had no money to build or finance the Chamchamal Power Project, how could he convince the Iraqi government to give him a letter of credit and where would the “other financing” come from? Subsequent events suggest the letter of credit would be arranged by another local connection, a Chicago Iraqi-American named Aiham Alsammarae, who is a one-time classmate of Tony Rezko and had been appointed as Iraq’s Minister of Electricity by L. Paul Bremer in July 2003. With Alsammarae at the head of the ministry, a letter of credit was possible. The money (“other financing”) would likely come from Nahdmi Auchi, who according to the Times Online, practically owned Tony Rezko. According to court documents, Mr. Rezko’s lawyer said his client had “longstanding indebtedness” to Mr. Auchi’s GMH. By June 2007 he owed it $27.9 million. A posting last week on a GMH-owned website, middle-east-online.com, portrayed Mr. Auchi as a Middle Eastern “Donald Trump” with a global business construction empire. Mr. Auchi visited the United States in 2004. Pictures show him meeting Emil Jones, the president of the Illinois state senate, an ally of Mr. Obama, a former state senator. Both Mr. Auchi and Mr. Obama say they have no memory of meeting each other. But, according to a source, the two may have had a brief encounter at the Four Seasons Hotel in Chicago where Mr. Auchi’s visit was being honored with a dinner attended by the governor when Mr. Obama, coincidentally in the hotel, dropped in. The third bidder on the Chamchamal deal was most likely Companion Security of Illinois. Companion Security was an Illinois company, concocted by Mr. Rezko along with his long-time Rezmar partner Daniel Mahru and an ex-Chicago policeman Donald Frawley, that proposed to train 150 Iraqis to be a security force at the new Chamchamal plant; and it included the novel concept to fly the Iraqis to Illinois for this training. Companion Security signed a contract April 18, 2005, with CPA Minister of Electricity Alsammarae — for which, it is alleged by now cooperating government witness Mr. Mahru, Mr. Alsammarae was paid a $1.5 million bribe. We must find the right balance — offering enough security to serve as a buffer and carry out a targeted, effective counter-insurgency strategy, but not so much of a presence that we serve as an aggravation. It is this balance that will be critical to finding our way forward. Second, we need not a time-table, in the sense of a precise date for U.S. troop pull-outs, but a time-frame for such a phased withdrawal. More specifically, we need to be very clear about key issues, such as bases and the level of troops in Iraq. We need to say that there will be no bases in Iraq a decade from now and the United States armed forces cannot stand up and support an Iraqi government in perpetuity — pushing the Iraqis to take ownership over the situation and placing pressure on various factions to reach the broad-based political settlement that is so essential to defeating the insurgency. But having visited Iraq, I’m also acutely aware that a precipitous withdrawal of our troops, driven by Congressional edict rather than the realities on the ground, will not undo the mistakes made by this administration. It could compound them. It could compound them by plunging Iraq into an even deeper and, perhaps, irreparable crisis. We must exit Iraq, but not in a way that leaves behind a security vacuum filled with terrorism, chaos, ethnic cleansing, and genocide that could engulf large swaths of the Middle East and endanger America. We have both moral and national security reasons to manage our exit in a responsible way. Sen. Barack Obama called Monday for U.S. troops to start leaving Iraq in 2007, arguing that the threat of an American pullout is the best leverage Washington has left in the conflict. “The time for waiting in Iraq is over. It is time to change our policy,” said Obama, a freshman Democrat from Illinois touted as a possible national candidate in 2008. Obama’s speech to the Chicago Council on Global Affairs came as the debate over Iraq policy has heated up in Washington, with policy makers making proposals that range from a phased withdrawal that begins in four to six months to an increase in troop strength. We had, for whatever it’s worth, sometime in June received a letter saying the contract was canceled. We protested the cancellation. And, then, we received this [the November cancellation] letter. Batchelor describes some of the last-minute efforts to bring the Rezko power plant project back from the dead. The Chamchamal construction plan was canceled in June 2006, and this not only ended the power plant deal for Rezko’s Rezmar International and Alsammarae’s KCI Engineering Consultants, but also it ended the Companion Security deal. Companion was nested inside Chamchamal. The security guards to be trained in Illinois were for Chamchamal. This is important to understand. The same men controlled all three bids. Mr. Rezko said, “We protested the cancellation.” How did they protest? It appears that part of the protest was to send Mr. Frawley to Senator Obama in August 2006 to seek help reviving the deal. Also, according to a report by the Chicago Sun-Times, Mr. Frawley negotiated over a six-month period with Senator Obama’s staffer Seamus Ahern at the Moline, Illinois, office. The explanation at the time was that the senator regarded Companion Security as an employment opportunity for the troubled Quad Cities area around Moline. Alsammarae put up $1.9 million in equity in his Oak Brook mansion, along with $840,000 in equity from two South Loop condominiums, according to court records. In recent days, he appeared in the downtown federal courthouse to pledge his property and signed papers related to Rezko’s bail. That proceeding, however, was conducted in a private session with U.S. District Judge Amy J. St. Eve and lawyers. Records from the proceeding weren’t immediately released. Despite what you have read, the Rezkos did not have the money in the first part of 2005 to put down $ 125,000 on the lot they purchased. The loan from Auchi allowed the transaction to happen. There is more to this story and it involves GE. profile position as Governor of Illinois, with brashness by nature and a less stealthy approach to pay to play politics than Obama, the feds began investigating him in 2003 and reports soon hit the Chicago media of corruption in his administration. The bulk of the charges in the Criminal complaint, indictment and evidentiary proffer and indeed, what the Tony Rezko trial centered around, took place from 2003 to 2005. They include much activity involving the TRS, Teacher Retirement System, Hospital construction approval, a plan to shakedown Children’s Memorial Hospital, appointments to state government such as Ali Ata to the Illinois Finance Authority and real estate transactions involving Blagojevich’s wife Patti. One of the clearest examples of impacting the citizens of Illinois was the corruption of the TRS. bribes if the Crystal Lake facility won approval, Levine has testified. So, why would the prosecution of Blagojevich be delayed despite the fact that he profoundly affected the citizens and state of IL? Obama had a clear role in the rigging of the health planning board. Obama played a role in cronyism affecting the TRS, Teacher Retirement System. A blagojevich trial before the 2008 elections would have stopped Obama. Tony Rezko would not talk about Obama, Blagojevich did and would. The following facts make the argument that Rod Blagojevich should have been arrested long before December 8, 2008 and before Tony Rezko. Pamela Meyer Davis began wearing a secret FBI wiretap in late 2003 to record conversations involving state health planning board. Most of the corruption in the Tony Rezko, Stuart Levine and Rod Blagojevich indictments took place between 2003 and 2005. Counts 1, 2 and 4 in the Blagojevich Indictment were eventualy dropped. Those counts covered that time period and represented approximately half of the indictment. June 7, 2004: Stuart Levine, member of the Illinois Health Facilities Planning Board, abruptly resigns. This is the first indication that the Blagojevich administration is under federal criminal investigation. July 2, 2004: Stuart Levine resigns from the state Teachers’ Retirement System board. May 9, 2005: Stuart Levine indicted on corruption charges. Federal subpoena issued to Tony Rezko. Oct. 25, 2005: The Chicago Tribune reports about a federal grand jury investigation into the alleged political hiring practices of the Blagojevich administration. Aug. 5, 2006: The Chicago Tribune reports that Stuart Levine is cooperating with the federal investigation of state government. Sometime between May 9, 2005 and August 5, 2006, Levine has begun cooperating with the feds. Levine knows almost as much as Rezko and becomes the key witness in the Rezko trial and other prosecutions. The Feds know plenty about Blagojevich at this point. Oct. 11, 2006: Tony Rezko is indicted on federal charges he sought millions of dollars in kickbacks and campaign donations from firms seeking state business. So far everything seems normal and makes sense. The next move should be to indict Blagojevich. Blagojevich, the governor, versus Rezko, the businessman, has the power to corrupt state government, has been doing so and thanks to Levine, the Feds know the details. If you have any doubts about this, read the transcripts of the Rezko trial. For example: “Gov. Rod Blagojevich has avoided answering questions about the corruption trial of Antoin “Tony” Rezko, the other day declaring, “I’m not in that case.” But Blagojevich’s name has been mentioned often. It was brought up at least 30 times Wednesday morning by Stuart Levine, the government’s star witness against Rezko. Rezko trial March 19, 2008. Oct. 22, 2006: Obama publicly states he is considering a run for the Presidency. Oct. 27, 2006: Stuart Levine pleads guilty in a scheme to squeeze millions of dollars from firms seeking state business. Court papers contain allegations that Rezko and Christopher Kelly were using their influence for corrupt purposes. May 2, 2008 a governor recall initiative was narrowly defeated. “State government is hemorrhaging with scandal and corruption,” Sen. Dan Cronin, sponsor. June 4, 2008 Tony Rezko convicted on 16 of 24 counts. Counts 1, 11, 12, 14, 15 were related to Mercy Hospital and the rigging of the Planning Board. Jan. 9, 2009 IL House votes 114 to 1 to impeach Blagojevich. 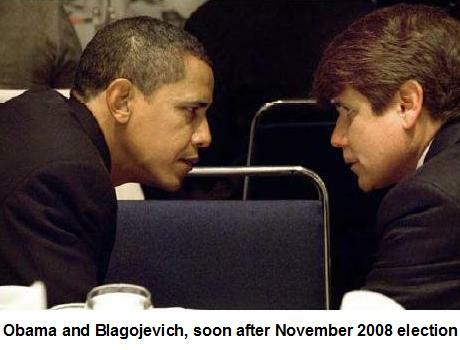 Jan 29, 2009 IL Senate removes Blagojevich from office. Why was Blagojevich left in office until December 2008? Some truths are ageless and I often quote Shakespeare. Fitzgerald admits that the crime spree had been going on for years. And I would add, criminal. I stand by earlier statements that the selling of the senate seat was a well crafted diversion. The facts presented above and in coming articles will make this intuitively obvious. Below are some resources for further reading. From the Morris Daily Herald June 21, 2012. The investigation of his businesses had hung over Nayak’s head for years, and his lawyer, Thomas McQueen, said the charges were not unexpected. “He knew this had never gone away,” McQueen said after the FBI arrested his client at Nayak’s Oak Brook home. A frowning Nayak appeared Wednesday at the Dirksen U.S. Courthouse in a rumpled shirt and entered a plea of not guilty to the 19 fraud counts against him. U.S. Magistrate Judge Maria Valdez ordered him released on a $10 million bond secured by six properties in Illinois and Indiana after Assistant U.S. Attorney Christopher Niewoehner told the court that Nayak has “rather significant assets” and ties to India. Nayak left the courthouse without commenting. In making their case against Blagojevich, federal authorities alleged that it was Nayak, a longtime friend of the Jackson family, who offered up to $6 million in campaign money in exchange for Jackson being named a senator. Blagojevich was found guilty on corruption charges last year that included counts involving the attempted sale of the U.S. Senate seat vacated by Barack Obama after his 2008 election to the presidency. Nayak was never charged in the Blagojevich case, and he quickly spoke with authorities after Blagojevich’s arrest in a bid for leniency. But he never was used as a witness, either, and investigators continued to look into his businesses. Jackson testified at Blagojevich’s trial that he had no knowledge of a scheme to buy the Senate seat. The indictment of Nayak is seen as one of the final offshoots of the sweeping federal investigation known as Operation Board Games, which in addition to Blagojevich led to convictions of fundraiser Antoin “Tony” Rezko, formerAld. Edward Vrdolyak, Republican power broker William Cellini and others. One of the final sentences in cases connected to that probe could be handed down as soon as next week, when political insider turned federal witness Stuart Levine is expected to learn his punishment. Sources have confirmed that the Board Games investigation is wrapping up. U.S. Atty. Patrick Fitzgerald is leaving office at the end of the month, and one of the lead prosecutors against Blagojevich, Reid Schar, already has left. “The indictment unsealed Wednesday alleges as part of the scheme that “physicians deceived their patients by not disclosing that they were being paid for making referrals to Nayak’s facilities,” but Nayak was the only person charged. He allegedly created false contracts to disguise some of the illicit payments, describing them as money for advertising, according to the document. Prosecutors are seeking $1.8 million in “alleged fraud proceeds” in the case. In one kickback scheme, prosecutors alleged, Nayak paid one person, identified only as “Individual A,” more than $2 million in checks drawn on his surgery centers’ accounts. In return, “Individual A” gave Nayak cash equaling about 70 percent of the value of the checks, according to the indictment. In the Blagojevich case, Nayak’s friend Bedi testified that Nayak issued about $2 million in checks to a Bedi-owned company. Bedi testified he provided cash in return and said he knew Nayak was cheating on his taxes by making the payments. Nayak’s businesses have over the years needed the approval of state regulators and auditors, and Nayak became a big campaign bundler and contributor, donating more than $779,000 to elected officials including Blagojevich, Attorney General Lisa Madigan and Obama from the late 1990s until his name surfaced in the Blagojevich scandal. The Tribune previously reported that after Nayak first opened several Chicago drugstores in the early 1980s, his businesses faced multiple audits by state and federal authorities. His name also came up repeatedly in one of the largest health care fraud investigations in Illinois history. That multiyear federal probe resulted in the shuttering of two hospitalsDoctors Hospital and Edgewater Medical Centerand the convictions of seven doctors and administrators. Nayak, who then owned a lab testing company called NR Laboratories as well as an outpatient surgery center, was among numerous people who came under scrutiny, the Tribune had reported. From Citizen Wells December 22, 2008. Continues to Spend Thousands on Elected Officials…in Iowa? Aurora in the path of a major development back in 2005. Obama said he wan’t going to be a “kingmaker” in Aurora. to exploit the taxpayers of Aurora for political purpose. said he would remain “neutral” in the heated mayoral race. “The past is whatever the records and the memories agree upon. From WND, World Net Daily, March 2, 2012. “Members of the Cold Case Posse in Maricopa County, Ariz., whose report to Sheriff Joe Arpaio yesterday confirmed there is probable cause to believe Barack Obama’s much-ballyhooed birth certificate document is a forgery, have begun briefing members of the county law enforcement team who may be involved in hunting for those responsible. At a news conference yesterday, Arpaio and the chief investigator for the specially appointed Cold Case Posse, Mike Zullo, confirmed that they had found evidence of forgery in the creation of the birth certificate image and fraud in the presentation of that piece of work as a real government document. They also said they found Obama’s Selective Service registration likely forged, and they said it appeared as though officials in Hawaii were covering up information about Obama. They also said it was not outside the realm of possibility that Obama might have been born overseas. All of this relates to the Constitution’s demand that a president be only a “natural born citizen,” which is not defined in the Constitution. But many analysts believe at the time the document was written that would have meant the offspring of two citizens of the country. Arpaio began the review at the request of hundreds of his constituents. They were concerned a fraudulent document was being used by Obama to be on the 2012 election ballot in Arizona. Arpaio said at the news conference that the investigation would continue, and he might ask for a congressional investigation to address the issue. He also suggested that other outside agencies may end up participating. While he said that decision remained in the future, sources told WND today that the Cold Case Posse, a team of volunteers not being paid by taxpayers, were briefing sheriff’s office investigators on the status of evidence, so that they might be able to participate in the future as those responsible for the fraud and forgery uncovered already might be pursued. The posse said it already has identified at least one person of interest in the alleged forgery. The Cold Case Posse had advised Arpaio that they believe forgers committed two crimes and sources say they now are sharing that information with Arpaio’s investigative team. Most of the mainstream media has performed like the “Times” of George Orwell’s “1984.” They have lied, twisted the truth and helped to prop up the Obama regime just as the “Times” did the bidding of “Big Brother.” 5 is the limit of Orwells that we bestow, but the media deserves nth degree Orwells. The jury in the Rod Blagojevich trial has been given their instructions and ordinarily I might say are determining the fate of Blagojevich. However, it is apparent to me that the fate of Blagojevich, Rezko and Obama was sealed in 2006 when the fix was cast. The trial of William Cellini is scheduled to begin in August. From the Chicago Tribune and John Kass November 16, 2008. Was I in Chicago, or in Rome before the fall? “Not guilty,” said William Cellini, 74, in a whisper. Cellini wore a nice blue suit. What he didn’t wear was a neon sign on his head pronouncing him the boss hog of the Republican half of the bipartisan Illinois Combine that runs this state with Chicago machine Democrats. Bill Cellini doesn’t need a neon sign. Everybody who is somebody knows who he is. He’s said to be worth hundreds of millions of dollars. Not bad for public service. “Illinois is Six Degrees of Bill Cellini. Amazingly, Webb and Cellini are listed together on the board of directors of Lakeside Bank, run by the politically influential Cacciatore family. One of the original Lakeside Bank investors is Fred Bruno Barbara, the Bridgeport trucking boss, waste management expert and close friend/fashionista of Mayor Richard Daley. “The Combine wants Fitzgerald promoted out of town. But President-elect Barack Obama has promised newspaper editorial boards he would keep Fitzgerald in Chicago to fight political corruption. That’s the same President-elect Obama with Mayor Daley’s guy Rahm Emanuel as his chief of staff, and another Daley guy, David Axelrod, as Obama’s chief strategist. The mayor’s brother Billy is one of Obama’s chief economic advisers. Whew! Some political analysts become quite upset when “Daley machine” and “Obama” are mentioned in my column. They feel compelled to give me a vigorous corrective. But this same Flat Earth society denied the existence of a Combine for years, then shut up for a while when Obama’s real estate fairy Tony Rezko was convicted in the federal government’s Operation Board Games probe. Cellini did not get Patrick Fitzgerald removed from Chicago, or did he? Patrick Fitzgerald was named interim chairman of the Attorney General’s Advisory Committee of U.S. Attorneys (AGAC). As long as Obama controls the US Justice Department, there will be no Obama trial. What was Barack Obama up to in 2004. From Citizen News June 11, 2011. “What was Barack Obama doing at that time? From Free Republic June 16, 2010. “The name of President Obama came into play this afternoon at the political corruption trial of former governor Rod Blagojevich as an associate of political fund-raiser Tony Rezko testified that Rezko asked him to write a $10,000 check to Friends of Obama. The Chicago Sun-Times reported in January 2008 that Glenview businessman Joseph Aramanda, who is testifying today, made the donation as part of a scheme orchestrated by Rezko. Aramanda gave $10,000 in campaign cash to Obama’s U.S. Senate campaign on March 5, 2004, according to records. The money came from part of a finder’s fee Aramanda received, but did no work for, thanks to Rezko. “Attorney Michael Gillespie even brought Barack Obama into the mix, getting Aramanda to note that when he met Blagojevich at Rezko’s mansion, Obama was also there.